Londoners can sometimes envy dwellers of those cities with glorious coastlines, where you can simply hop on a bus for a quick ride down to the beach to enjoy the crashing surf. Sydney, Cape Town and Miami spring to mind. 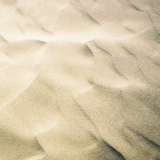 But did you know that London does, in fact, have its own stretch of golden(ish) sands, situated inside the London Orbital, just 14 miles from the centre of the city? So if you're hankering for a bit of a sunbathe (as long as there is actually sun), you might want to saunter down to the lovely Ruislip Lido. OK, it's not quite the Gold Coast, and there's no Table Mountain providing a dramatic backdrop, but it has a sandy beach nonetheless. 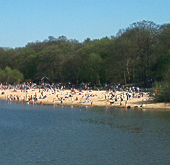 In a previous incarnation, Ruislip Lido was a reservoir, operating as a feeder for the Grand Union Canal. It's been a lido for more than 70 years, and over this period a range of attractions have been introduced. Besides the beach area, there are plenty of boating opportunities (motor boats, paddle boats, rowing boats). There's also a children's playground, which'll come in handy in the unlikely event that they get bored building sandcastles. One feature that might prove too hard to resist is the popular miniature railway that gives passengers a 2.5-mile ride along the lake. The ride takes about half an hour and costs a couple of pounds. The area is also an ideal spot for a picnic or a leisurely walk, with Park Wood beside the Lido providing some pleasant trails. So if the sun shines on a weekend and you can't be bothered to make the trek south to Brighton or Eastbourne, you might want to consider taking a look at Ruislip Lido instead. Why? It'll be like a day at the seaside without actually going to the seaside. When: On a sunny day. Where: From Ruislip tube station, take the H13 bus.